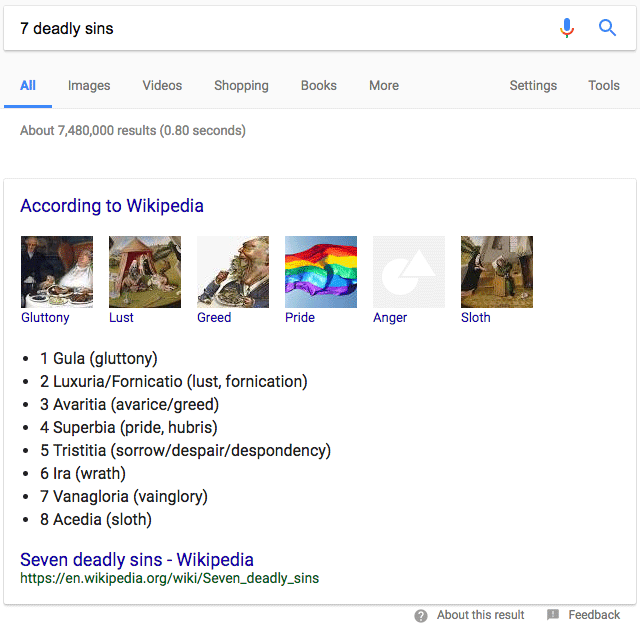 Go to Google and search for [7 deadly sins], Google will show you there fancy featured snippet result and for number four, superbia or pride or hubris, Google will show a photo of a Gay Pride flag. Of course, this can be super insulting to many people but there is a technical reason for it. If you search for [pride] in Google, the Pride flag shows on on the right hand side knowledge panel. So Google is technically matching the word "pride" in the 7 deadly sins query to the featured snippet. It is wrong, the wrong reference, but that is likely the technical explanation for it. It was reported about 24 hours ago, it is still coming up this morning. We do know Danny Sullivan from Google said on Twitter that they are checking into it. Update: They have pulled the featured snippet completely for now.